So, what's a Godiva? It's a five pound note, or, in Cockney speech, a "five-ah," which rhymes with "Godiva." This is Cockney rhyming slang at its most basic--for the word intended, substitute another word with which it rhymes. There is another, more meta (to use a Greek-rooted prefix recently made into an adjective) version in which, instead of the word that rhymes with the intended word, another word associated with the rhyming word is used. For example, instead of "Godiva" for a five-ah, say "Lady," a word usually yoked to Godiva, as in, "That'll cost you a Lady." I was introduced to the meta version some years ago at the bar of the Bells of Hell. I was chatting with an English friend when a--how you say?--well-endowed young woman walked by. "Nice set of Bristols," my friend said. His meaning was obvious to me, but the usage wasn't. "There's a football club called Bristol City," he explained, "and city rhymes with... ."
A plain meaning of "Gone for a Burton" then would be "Gone to the pub for a pint." Regarding a deceased friend, it could mean "Gone to that big pub in the sky." Still, I wonder if it might not be an instance of Cockney rhyming slang. Burton doesn't have any obvious rhyme relating to death, nor does Trent, nor ale, the brew that made Burton famous. But it occurred to me that a properly drawn pint of ale has a head, which rhymes with dead. If this is in fact the origin of the expression, it could be an instance of meta-meta rhyming slang, going from Burton to ale to head. If, however, Burton is taken as a synonym for ale, then it's only a single meta. 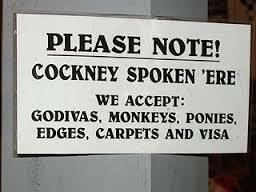 Regarding the sign in the photo at the top of this post, I found translations for "monkeys" (hundred pound notes) and "ponies" (twenty-fivers) in this glossary. I don't know the meaning of "edges" or of "carpets." Perhaps one of my English friends can help. "Visa," I presume, means just what it is. Neil Diamond singing "Sweet Caroline" at Fenway Park, April 20, 2013. For my wife, a cradle Red Sox fan, and for Boston. I've never been much of a Neil Diamond fan, and don't know why this song became a tradition at Fenway, but I admire him for doing this. Thanks to Eliot Wagner for the link.